Thermal Expansion tanks are used to help eliminate the expansion forces caused by heating and cooling of pressurized systems water. Quick Ship inventory 5 available sizes from 175 gallon up to 1,040 gallon. Thermal Expansion tanks are used to help eliminate the expansion forces caused by heating and cooling of pressurized systems water. The tank air pressure must be field adjusted for proper system operation. It is important to properly charge the tank with enough pressure which equals the cold water supply pressure, prior to filling the system. Failure to properly pressurize the tank will cause the cold supply water to expand the bladder, greatly reduce the expansion capabilities. The heavy duty butyl rubber bladder keeps the system water separate from the tank, eliminating tank corrosion. 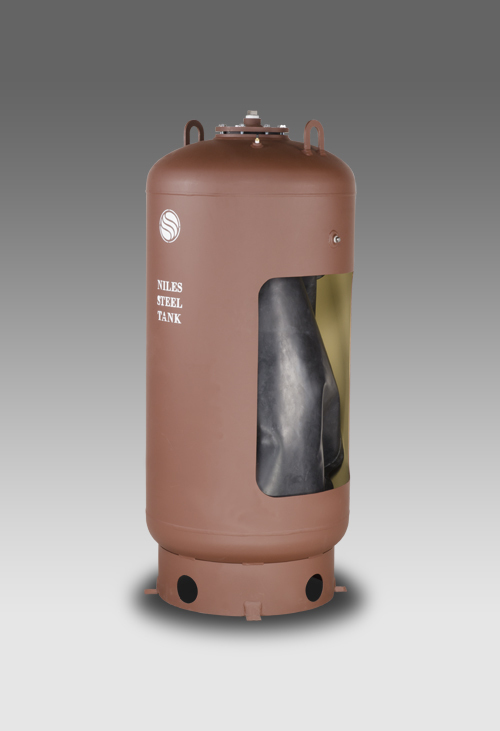 The Niles Steel Tank Expansion tanks are designed for commercial heating applications and potable water applications. As the water is heated, it expands into the bladder and pushes against the air cushion. As the system cools, the pressure in the tank pushes the system water back into the piping, maintaining system pressure.